The Scioto River starts out as a small ditch running through a farm field in Auglaize County and becomes a small creek about 80 miles northwest of Kenton in Hardin County. A little over 230 miles later, the Scioto River finally empties into the Ohio River at Portsmouth. The Scioto River is one of the longest rivers in Ohio. Long before European settlers came into the Ohio Territory, the Scioto was used by native people's as a navigation tool. Many of the mounds built by the early Woodland Indians still remain along the Scioto and its tributaries. The Scioto, like most rivers, has always been prone to flooding. One of the benefits of this flooding over 1000s of years, is the creation of a rich topsoil that is highly regarded for growing crops. Throughout the centuries, the river has meandered a bit, changing its course through the Scioto River valley, creating a wide flood plain in many areas that offers excellent farming. When the Europeans came to the Ohio territory, they too used the Scioto as a navigation tool. Early on they used canoes to navigate the river. Later, larger boats were built to navigate the river from where Columbus now sits, south to Portsmouth and from there, either to Pittsburgh or New Orleans. The name “Scioto” is an American Indian word meaning “deer.” Like today, the area area around the Scioto is rich with deer and other wild life. Also along the Scioto are outcroppings of salt, that brought Native peoples from great distances to acquire. There are 2 major dams on the Scioto River, both in Columbus, that are used for drinking water and recreation. There are also numerous low-head dams along its course, and some of these are being considered for removal, although this probably will not happen soon. Water travel was much quicker and cheaper than land travel during this era. Ohio settlers used the Scioto and the state’s other rivers to transport their crops to market. A portion of the Ohio and Erie Canal also used part of the Scioto River. Both Indians and white people settled along the river due to the fertile farmland in the Scioto’s floodplain. Today, modern ships are too large to navigate the Scioto, and Ohioans primarily use the river for recreation and for drinking water. 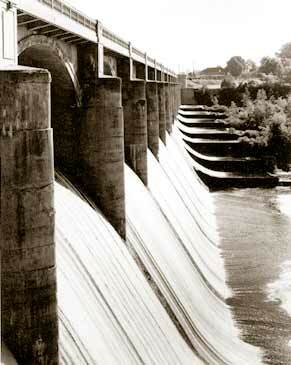 Completed in 1908, Griggs dam was the first dam built across the Scioto River. Julian Griggs was the chief engineer for Columbus at the time. The purpose of the dam was to provide an adequate supply of water for the growing city. The O'Shaughnessy Dam was completed in 1925 to provide an additional water source for Columbus and the surrounding communities and to further control flooding that was especially apparent in the 1913 flood that destroyed much of Franklinton. Originally, it was proposed to increase the size of Griggs Dam, but Jerry O'Shaughnessy, superintendent of the Columbus Waterworks opposed this idea and instead proposed building a 2nd dam further up on the Scioto. Although Jerry O'Shaughnessy didn't live to see the new dam completed, his idea for building the 2nd dam proved mostly successful. Combined, both dams provide 6.2 billion gallons of water for Columbus while only restricting a small percentage of the river's natural flow. In 1987, Columbus installed a small hydroelectric capabilities to the O'Shaugnessy Dam. While the turbines can only generate electricity when there is sufficient water flow, when operating the 2 turbines can produce 5 megawatts of electricity. Today, Columbus' demand for water (130 million gallons are used daily) far exceeds the capacity of the 2 dams on the Scioto. In anticipation of this need, another dam was built in 1955 on the Big Walnut Creek on the northeast side of the city. This dam was called Hoover Dam in honor of 2 brothers, Charles and Clarence, who both worked in the Columbus Waterworks. Plans are being considered for building an underground water storage reservoir in Delaware County for future needs.